Thunder Roads Ohio (TRO) is proud to present the 2018 BUCKEYE THUNDER RUN - a state-wide, summer-long riding challenge hitting the coolest riding destinations and events across Ohio, presented by RUSS BROWN MOTORCYCLE ATTORNEYS! This is a riding challenge like no other and features great prizes every month that you earn by simply getting out to ride! Checking in at Ride Stops! STARTING IN MAY, Thunder Roads Ohio will present a list of Thunder Run Stops each month. These stops are selected based upon the recommendations of our readers and confirmed by our editors. ALL STOPS have been screened by our editors and are places we feel comfortable recommending to you. We never simply add a stop because they are willing to write a check. Riders can then hit these locations and present their Ride Cards in order to register at each stop. Once a Rider has registered at the stop - their Card number is then entered into the drawing for that stop. Thunder Roads will then select rider checks-ins randomly each month from across the state for special prizes and incentives. Checking in at TRO Tour Stops! Throughout the year, the TRO ROAD CREW will be hitting rides, rallies, bike shows, and various events throughout the state – and beyond! In some cases, the CREW will be attending national rallies and other events throughout the Midwest – including Michigan and Pennsylvania motorcycle events. Anywhere the TRO CREW is at – instantly becomes a RIDE STOP! “MAKE YOUR OWN RIDE STOP!” – NEW FOR 2018! All of our Ride Stops have been first recommended by RIDERS, invited to apply, and then finally reviewed and approved by our editors. For 2018, we’ve added another option – by which Riders can recommend a RIDE STOP by simply “checking in” through their Facebook account with the hashtag #TRO. Within the post, BTR Riders should say that they are “Making this their Ride Stop” and that we should also. You can also include why – and even do it all within a posted video as well. Special prizes each month are allocated for these check-ins and the stop itself can win – if applicable. Selected “MAKE YOUR OWN RIDE STOPs” have a chance to win up to $5,000 in prizes – and each posting increases their chances to win! In such cases, the person(s) nominating the Stop with their check-in is also eligible for additional prizes as well. $500 Amazon® Gift Card to be awarded to a chosen Rider nominating a Winning Stop with their check-in! IT’S NOT MANDATORY, BUT THIS ALLOWS INSTANT CHECK-INs AND INSTANT PRIZES! FOR THOSE THAT PREFER OLD SCHOOL, YOU CAN STILL CHECK IN WITH THE BOARDS. 1.TAKE A PICTURE OF YOURSELF, YOUR BIKE, YOUR CREW, AND CHECK IN AT YOUR LOCATION. Prizes are developed by both Thunder Roads and our sponsors - allowing for some exciting options. They may include stays at exciting locations, riding gear or accessories, gift certificates, cash, rally passes, concert tickets, and even the opportunity to win factory and custom motorcycles! The beauty and simplicity of this program is that anyone can win with any check-in, but your chances of winning are increased by the amount you ride! The dedicated rider trekking across the state has a greater chance of accumulating prizes - but the couple that can only get out a few days a month to ride can also win! Every check-in counts as an entry in the "drawing" - so if you hit 40 stops in a month, you have twice as many chances of winning as someone that only hits 20. The more you ride - the more opportunities you will have to win! That's the whole idea - to encourage everyone to get out and ride! Every month the TRO staff will randomly select winners from the check-ins. Some prizes will be specific to the particular stop - and usually sponsored by that stop. For instance, a leather shop may award a custom leather vest to someone visiting their store during the month of June. That would be a prize specific to that stop and only riders checking in at that location would be eligible for that prize. Other prizes will be statewide, with everyone checking in at any location eligible to win! If your check-in is drawn, Thunder Roads will post your card number on our website and in the magazine as well. Riders will then have at least 45 days to "claim" their prize. For state-wide prizes, winners will often have the opportunity to select from a number of prize options. For instance, a rider might have the option of winning an Ohio Bike Week Rally Package that includes accommodations and extras for attending North Coast Thunder Rally. If that rider isn't able to take advantage of that prize - they might opt for a Premium Leather Jacket or Gift Certificate instead. Not all prizes are exchangeable. Riders are able to win multiple prizes - based upon the drawing of their check-ins. Some prize drawings are specific to only check-ins for the particular month - while other prizes are drawn from check-ins season long. ALL CHECK-INs remain in the system for end of the season prizes! Each month, the TRO Crew will randomly select WINNERS that have checked in through their social media with the #TRO hashtag. If their Ride Card is visible, we will register the Card Number as a winner and possibly send notification through email. 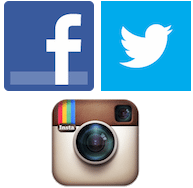 In most cases though, we will contact through your social media and the winning post. Digital winners have 15 days to contact TRO in regard to the prizes. In some cases, there may be less time due to constraints regarding the prize(s) – such as tickets for a particular concert. For 2018, Thunder Run Riders have the chance to win 6 different motorcycles, Sturgis Rally Packages, hundreds of tickets to concerts and some of the most exciting motorcycle events in the state, and countless other great prizes! 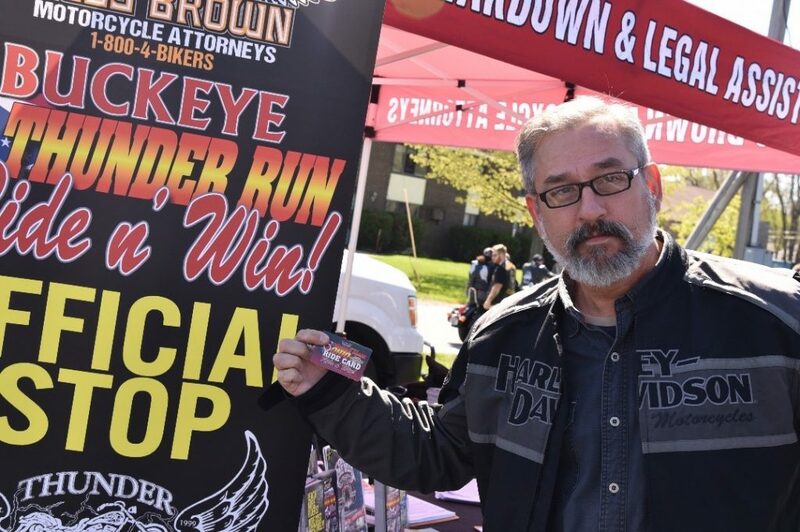 The 2018 Buckeye Thunder Run is supported by our sponsors, so we want to encourage everyone to support them in turn. For that reason, we will issue a BONUS CHECK-IN to riders spending $10 or more at Official Ride Stops. The bonus criteria may be adjusted at some stops to accommodate riders on particulars of that stop. Specifics of each stop will be listed each month in Thunder Roads as part of the Stop Listing. Get your Ohio Ride Card. Get the list of stops each month from your Thunder Roads Magazine, the website (ThunderRoadsOhio.com), or Facebook. Ride out to these stops and show them your card or check in with the #TRO Hashtag on social media. And then you win cool prizes, including cold hard CASH! 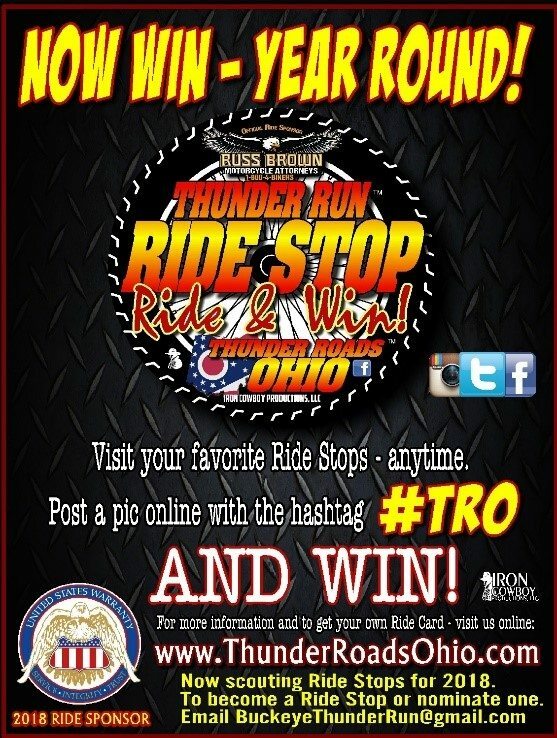 The first step will be for riders to register for their Thunder Roads Ohio Ride Cards. A number of select locations will serve as Registration Centers. Riders can easily register at these points – free of charge. They will then receive their Ride Cards. You can request a Ride Card through our website! You can now go online and register for your Thunder Run Ride Card through our Online Store – Click Here. There is a $5 convenience fee for this option – but ALL PROCEEDS are applied to our Warrior Fund, sponsoring charitable motorcycle events and organizations across Ohio. PLEASE NOTE - You can still use your previous Ride Cards. All Ride Card registrations carry over however, you are welcome to pick up a new shiny one if you’d like. 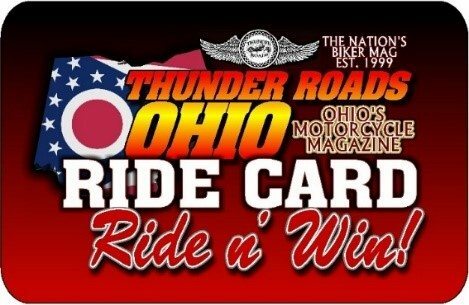 Thunder Roads will also be registering riders for Ride Cards at specific events throughout the year as we distribute magazines. Key events, such as Ohio Bike Week or Bike Nights will have a special booth for Ride Card registrations. In most cases, we will be offering special incentives both for those registering for the cards and those checking in with their previously issued cards at these stops. Thunder Roads will also be working with charities and various non-profit events to include them in the Run schedule as well. This will be an easy means of encouraging participation and attracting riders from outside the local communities. In many cases, we will have specific prize drawings for those at these events. The Ride Cards allow participants to easily and safely check in at all stops. Some Thunder Roads Sponsors will also be offering discounts to readers that present the cards. Thunder Roads will be listing special discounts and offers in the magazine throughout the year as an added value to readers and means of encouraging our partners to offer these extra savings. PLEASE NOTE: Once you have received your OHIO RIDE CARD, you will not be asked to provide personal information or emails at any location for check-in. You simply enter your ride card number! This is not simply a “Chinese fire drill” or mad-dash across the state. This is a Ride program. It is meant to be a means for readers to discover new riding destinations and enjoy the ride there. In fact, we have designed the program to encourage folks to break out of their local routes and trek to the furthest corners of the state. One of the really exciting aspects of our ride program is that the Buckeye Thunder Run can evolve with new stops, special prizes, and other updates throughout the year! We will be adding and dropping stops each month. Readers will be able to nominate stops, we’ll investigate them, and if we agree that it’s a suitable stop – they’ll be invited to join the run. Some stops may only run a few months – and possibly not consecutive. A cool winery in Geneva might be a stop early in the season, and then we bring them back during the harvest season! We can also modify the run if it turns out that something just isn’t working. We want to keep things exciting for you – the readers and riders on the run. We’re bikers and it’s all about the ride. We want to help create fun experiences for you and share some cool spots in our state. And we want to discover new spots as well, which is why we are encouraging everyone to nominate their favorite riding destinations. Again, this is not simply a sales tool for us or meant to subsidize the magazine! We have designed this run to entertain and challenge our readers – as well as promote our partners. As with the magazine itself, the Buckeye Thunder Run is presented through the support of our sponsors and partners across the state. We have secured several key sponsorships already, but opportunities remain. If your business would like to get involved, this is a great way to promote yourself across the state in a positive manner. Even if your organization is not a riding destination you might become a sponsor for the tremendous promotional value it offers through the constant media attention it will receive. Obviously, this will be a heavy focus within the magazine, but we are also working with radio and other media outlets to help spread awareness of the run. Sponsors are able to tap into this network and enjoy great exposure. Of course, one of the key components in this whole program, second only to the riders themselves, is the stops. The Thunder Roads team has spent a lot of time collecting nominations and researching stops for the Run; but there are undoubtedly plenty more stops out there. If you have a venue or event that you would like to get involved in the run, please don’t hesitate to let us know about it. If it’s your place, we will get in touch shortly with more information on the run and what’s involved. If you are recommending a spot for someone else – we will reach out to them and let them know they have been nominated. If you can suggest a contact person, that can help expedite the process. You can send information to BuckeyeThunderRun@gmail.com or call 440-678-8608. The Official RIDE kicks off MAY 1, 2018! Where is the list of stops? Not in the May issue! Right now they are in a rough excel format but we are working on updating the format to make it more user-friendly. Thank you for asking!